Lapis lazuli , or lapis for short, is a deep blue metamorphic rock used as a semi-precious stone that has been prized since antiquity for its intense color. 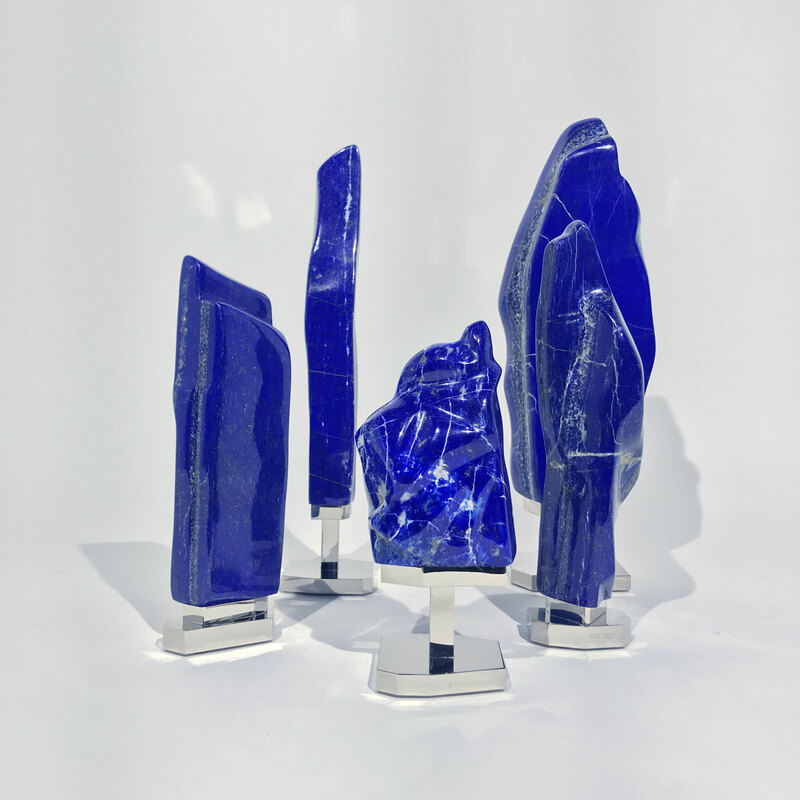 As early as the 7th millennium BC, lapis lazuli was mined in the Sar-i Sang mines, in Shortugai, and in other mines in Badakhshan province in northeast Afghanistan. Lapis was highly valued by the Indus Valley Civilisation (3300–1900 BC). Lapis beads have been found at Neolithic burials in Mehrgarh, the Caucasus, and even as far from Afghanistan as Mauritania. It was used in the funeral mask of Tutankhamun (1341–1323 BC). Lapis was also used in ancient Mesopotamia by the Akkadians, Assyrians, and Babylonians for seals and jewelry. In the Mesopotamian poem the Epic of Gilgamesh (17th-18th Century BC), one of the oldest known works of literature, lapis lazuli is mentioned several times. The Statue of Ebih-Il, a 3rd millennium BC statue found in the ancient city-state of Mari in modern-day Syria, now in the Louvre, uses lapis lazuli inlays for the irises of the eyes. In ancient Egypt, lapis lazuli was a favorite stone for amulets and ornaments such as scarabs. Lapis jewelry has been found at excavations of the Predynastic Egyptian site Naqada (3300–3100 BC). At Karnak, the relief carvings of Thutmose III (1479-1429 BC) show fragments and barrel-shaped pieces of lapis lazuli being delivered to him as tribute. Powdered lapis was used as eyeshadow by Cleopatra.